The latest news from Bardejov and the BJPC is here! 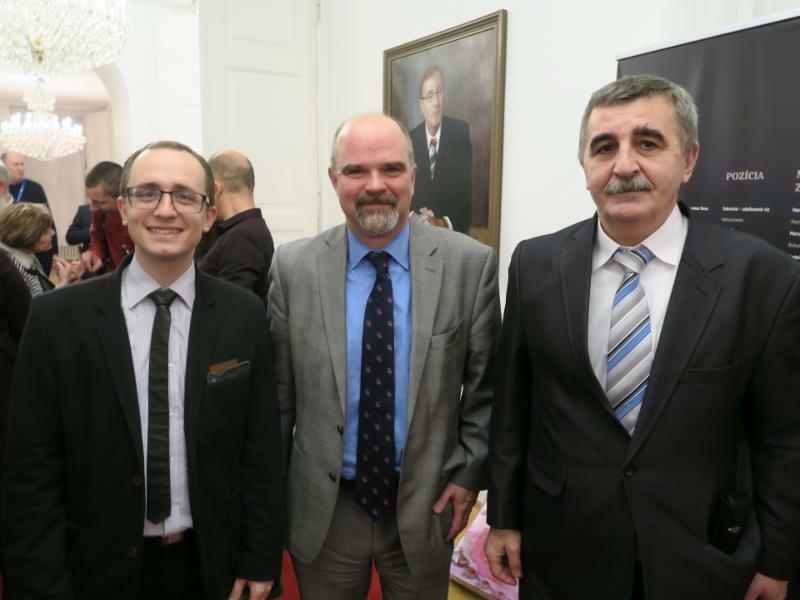 The Yad Vashem ceremony for awarding the Slovak Righteous Among the Nations who were declared Righteous in 2017, took place on January 31, 2018 in the historical building of the Slovak National Council in Bratislava. 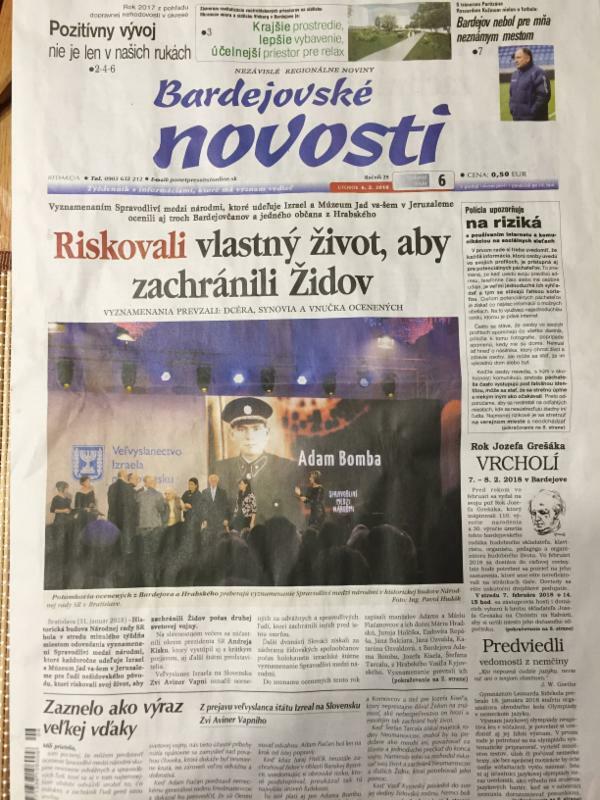 The ceremony was hosted by the Israeli embassy in Bratislava in cooperation with the Slovak government. This year four individuals from Bardejov were awarded: Adam Bomba, Štefan, Tarcala, Jozef Kisel and Vasil Kyjovský. 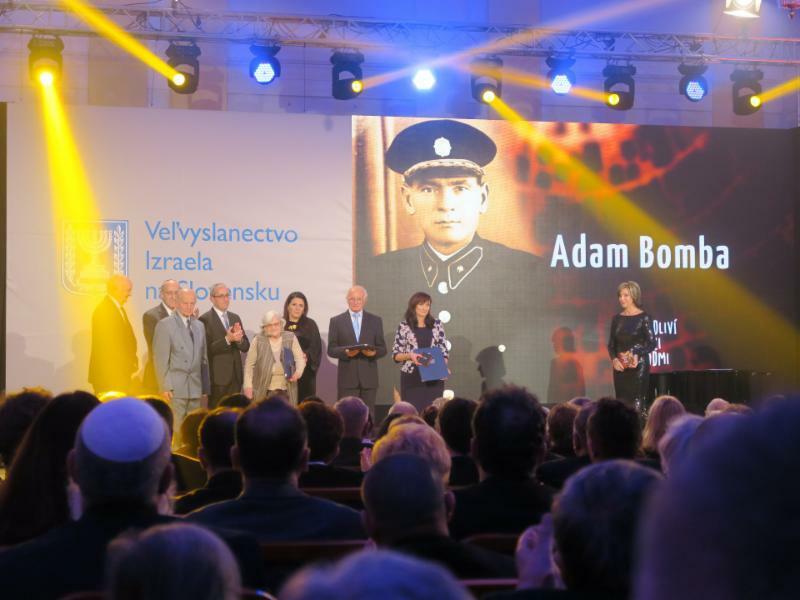 These are the first individuals from Bardejov to ever be awarded by Yad Vashem. The program began with a speech by the Israeli ambassador to Slovakia, H.E. Zvi Aviner Vapni, followed with speeches by the Slovak President, Mr. Andrej Kiska, the Slovak Speaker of Parliament, Mr. Béla Bugár, and the Slovak Deputy Prime Minister, Mr. Peter Pellegrini. The ceremony was simultaneously interpreted from Slovak to English and vice versa. After the speeches, five short movies were screened for each individual or group of Righteous. After each film the descendants of the Righteous were invited to the stage to receive the awards and the certificates. 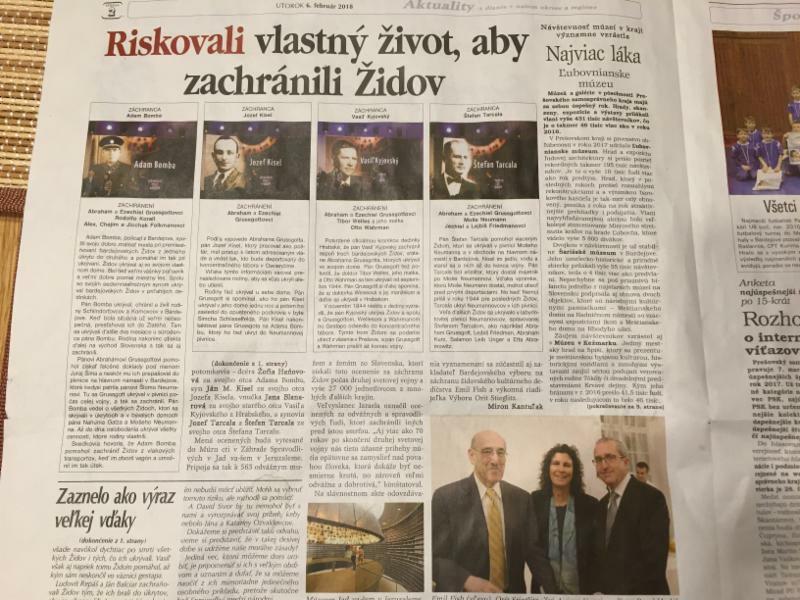 The film about the Righteous from Bardejov told the stories of each of the four individuals who were awarded, showing their descendants in the Bardejov Holocaust Memorial. 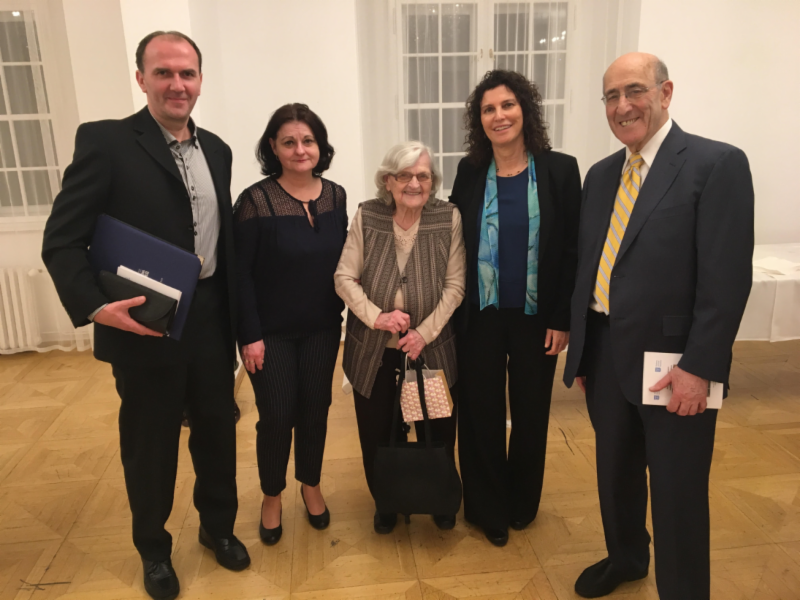 After the film Mr. Emil Fish was called to the stage by the moderator, and together with the Israeli Ambassador and the Deputy Head of Mission, presented the awards to the descendants of the Righteous from Bardejov. 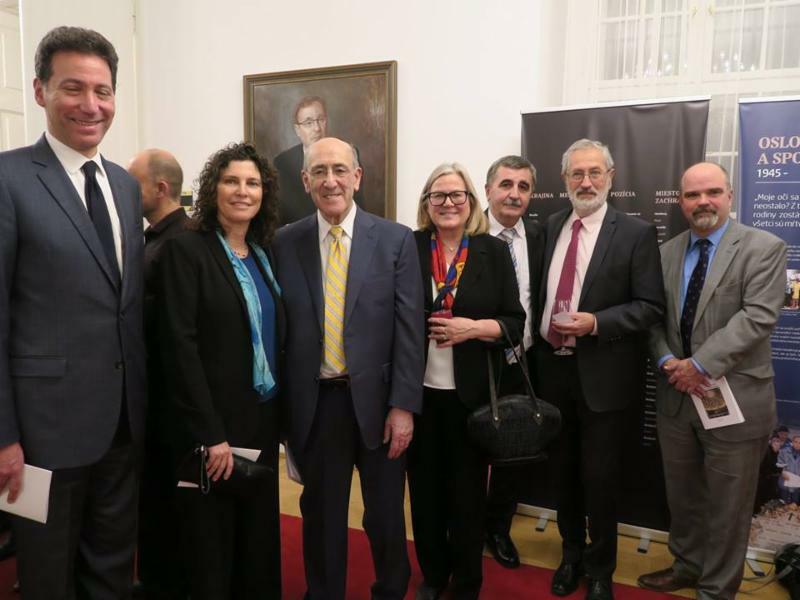 You may also view photos of the event posted on the Facebook page of the Israeli embassy in Bratislava and the page of Mr. Bela Bugar, Speaker of the Slovak Parliament . The New Holocaust Museum in Sered, Slovakia ( Sered Holocaust Museum ) was opened in 2016 and is part of the Slovak National Museum – Museum of Jewish Culture . The museum is built on the site of the former labor and concentration camp in Sered, and consists of an exhibition space, educational center and offices. Three of the five original barracks that were renovated for the museum are open to the public and two additional barracks are still under construction. The museum exhibits period documents, photographs, and items related to the persecution of Jews in Slovakia and the Holocaust, including an authentic cattle car that was used for the deportation of Jews to Auschwitz. The museum has a special section about the Sered concentration camp. Approximately 16,000 people passed through the camp during WWII, most of whom perished during the Holocaust. 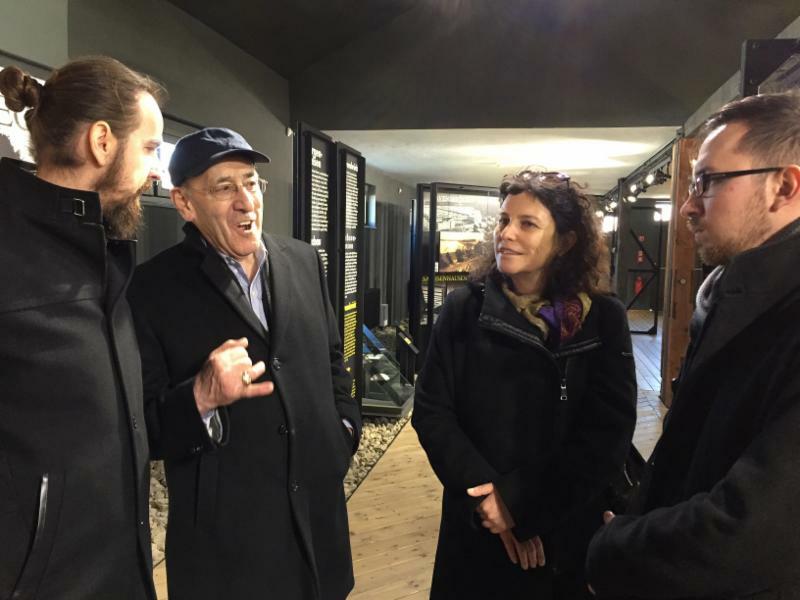 On the occasion of visiting Slovakia for the Righteous Among the Nations Ceremony in Bratislava, Emil Fish, Orit Stieglitz, and Peter Hudak visited the Museum in Sered where Emil shared stories of his time there. 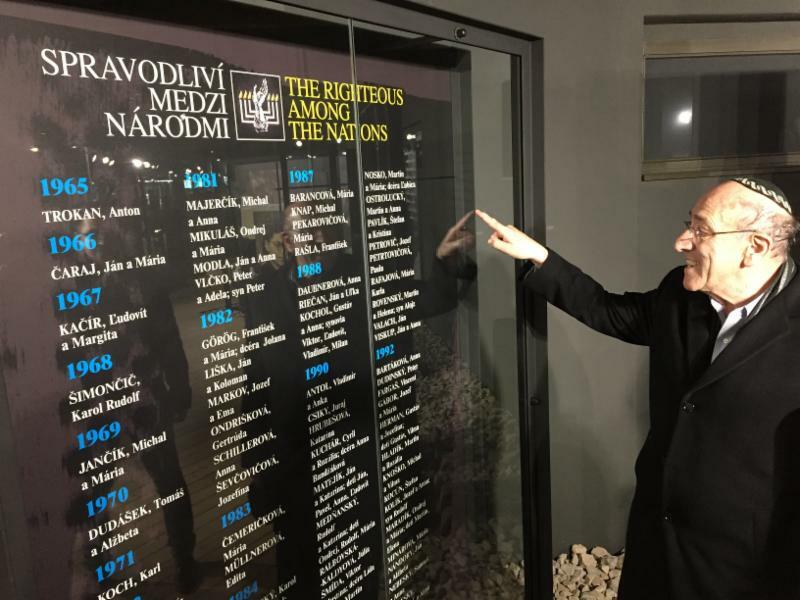 The museum also has a section about the Righteous Among the Nations, which displays the names of all the Slovak Righteous and the year in which they were awarded by Yad Vashem. Emil Fish was excited to find the names of Martin and Ana Ostrolucky, who risked their lives and in 1944 hid his family in a small attic in their barn. The Fish family contacted Yad Vashem and in 1991 Martin and Ana were declared Righteous Among the Nations. Mr. Fish talks about his time in Sered. In 1944 Emil and his family passed through Sered camp after being caught by the Gestapo in Bratislava. Emil, his sister and their mom were sent to Bergen Belzen while his father Herman was sent to Buchenwald. They all survived. Mr. Fish found the names of Martin and Ana Ostrolucky, who risked their lives and hid the Fish family in 1944 in a small attic in their barn in Nitra, Slovakia. 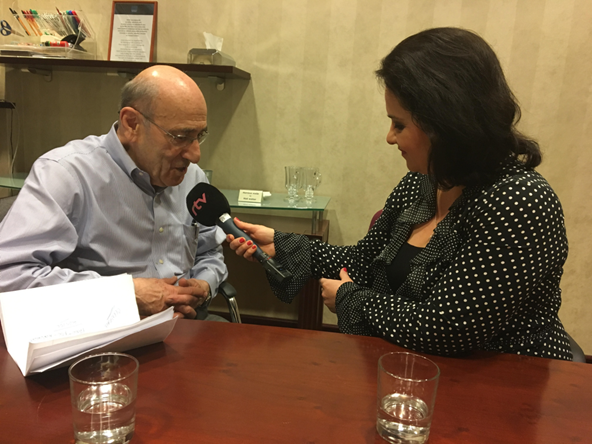 On the morning of January 31, Emil Fish met with Mrs. Dagmar Mozolova, a radio journalist from RTVS - Radio and Television of Slovakia, for a radio interview. 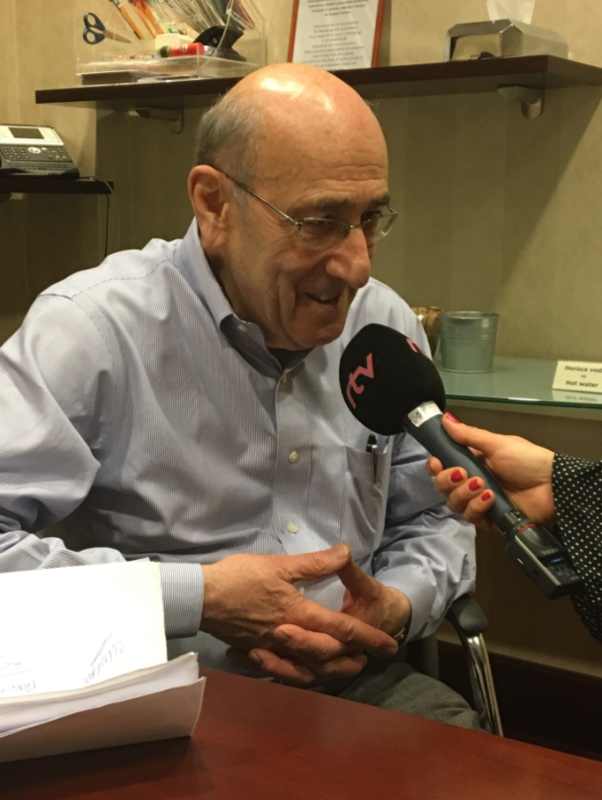 Mrs. Mozolova, who produces a special radio magazine about the Slovak Righteous first interviewed Jan Ostrolucky, the eldest son of Ana and Martin Ostrolucky who is 85 years old. She then contacted Mr. Fish, whose family was rescued by the Ostroluckys, and interviewed Emil for the same program. The Fish family was hidden at the Ostroloucky’s house in Nitra, Slovakia during the war, in 1944. The radio program was broadcast on National Slovak Radio on February 18, 2018. Click here to listen to the full interview in Slovak. 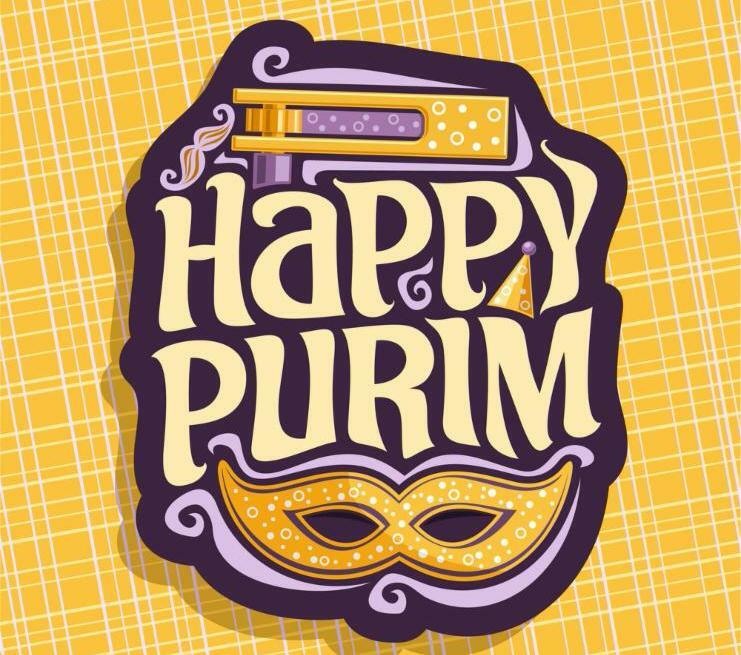 Our mission is to preserve Bardejov’s Jewish Heritage, memorialize and honor Bardejov Holocaust victims, and conduct educational outreach to school and community groups to teach tolerance and diversity. 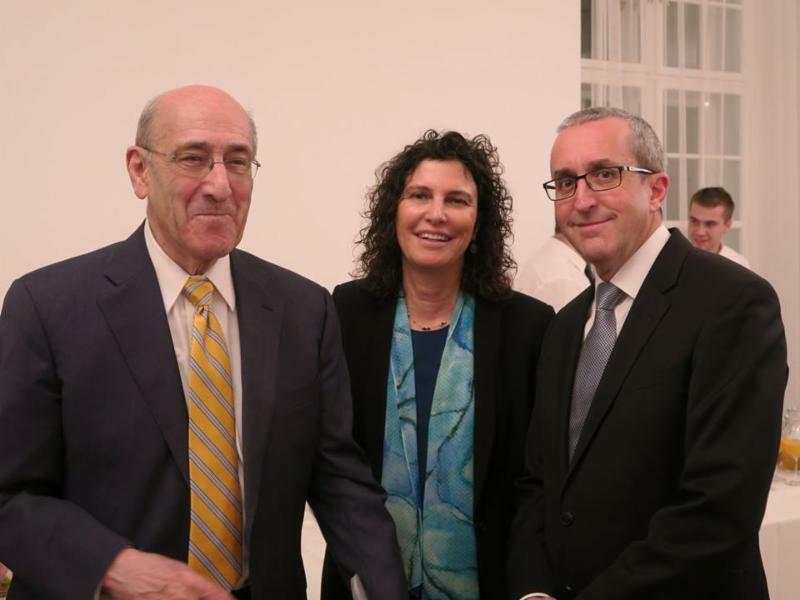 The Bardejov Jewish Preservation Committee is not funded by any grants and depends solely on the support of generous individuals. If you have any friends, or know of someone who may be interested in our organization, please invite them to fill out our mailing list request form so that they can receive updates and information from us.